Lou Quinse is a very interesting Italian folk metal from Turin, formed back in 2005. Their name means “15″ in the Francoprovençal dialect, an ancient language spoken in east-central France, western Switzerland, and northwestern Italy. Since its inception, the band mixed Occitan Alpine folk music and traditional instruments with extreme metal and in 2008 released the EP “Lou Quinse“. In 2011 they self-released their debut full-length album “Rondeau de la Forca“, an album I only recently got in my hands. “Rondeau de la Forca” is quite a short album, since its 8 songs last only for 32 minutes. All tracks are reinterpretations of original traditional songs in the band’s unique style. Like most groups of the genre, Lou Quinse include their own version of “Tourdion“, a song that must be the most commonly covered traditional song ever! Flutes, bag-pipes, tin and low whistles, bouzouki, hurdy-gurdy and diatonic accordion are some of the traditional instruments they use, which are totally dominating their sound. They combine (or better accompany) them with distorted guitars, borrowing elements from black, death and thrash metal. All songs move in very fast tempos, speeding up the original rhythms of the authentic compositions! Vocals are mostly on the brutal side, with very extreme black metal screams and a few more “human” melodic vocals, still not totally clean. Their production is not the best, and especially their metal instruments (guitars and drums) still need a lot of work in order to sound more powerful and natural. Luckily, this doesn’t affect at all the medieval festive, dancing, jolly atmosphere of the album, which is punctuated by the light-hearted, funny lyrics. “Rondeau de la Forca” is self-released by Lou Quinse in a standard jewel case edition with 2-page booklet, unluckily without the lyrics. You can visit the band’s official Facebook profile in the links below for more info and sound samples. 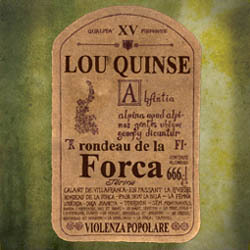 On March 2013, Lou Quinse re-issued their 2008 EP remixed and remastered by Tino Paratore at Cerchio Perfetto in 2013. Except for the five original tracks, the re-issue includes the brand new song “Lo Pal“, recorded in 2012, so its total duration is now over 28 minutes. The bonus track is an Occitan extreme version of the song “L’estaca“, which was composed by the Catalan artist Lluís Llach in 1968. “Lou Quinse – 2013 Reisue” is available digitally on their Bandcamp page. On May 2013 it was also released in a deluxe 12″ vinyl edition with inlay that includes all lyrics, plus a cd with all tracks remixed by XII Lo Penjat, available directly through the band. Lou Quinse have a very distinctive personality and despite the mediocre sound quality, I enjoyed very much their music, especially the full-length. I really hope they soon release its follow up, with a better production. In my opinion their music has more in common with the French folk metal scene than the Italian. It is obvious that their hometown’s geographical location and their Occitan traditional music roots have strongly influenced their sound. If you are a fan of extreme folk medieval metal, and if you want to listen to a “happy” amusing band that will make you cheer up and forget your problems, then Lou Quinse is a band you should check.